The earliest method of producing iron was by smelting iron ore in a small furnace or hearth known as a bloomery, using charcoal as the fuel. Bloomery sites were mostly located within the woodlands from which the charcoal was produced – rather than at the orefields – because vast amounts of it were used in the smelting process and the light and brittle charcoal did not travel well. A bloomery furnace took a number of forms, but in Lakeland typically had a base made of clay and stone, upon which was constructed a waist high tower made of clay on a coppice oak framework, with an internal diameter of 30-40cms at the base. Charcoal in the furnace was set alight using chopwood, bellows used to pump air into the fuel to raise the temperature, and more charcoal added to keep the furnace full. Once the temperature was sufficiently high – somewhere between 950ºC and 1125°C – a charge of small pieces of ore and more charcoal would be added through the open top of the furnace. A fresh charge, in equal weights of ore and charcoal, would be added regularly until it was judged that there was enough for the size of the hearth. A typical charge of 15kg of ore (and the same of charcoal) would give a 1.5 kg bloom – the size of a man’s fist – sufficient for just one or two finished products such as farm tools. By the Middle Ages the bloomeries were taller and larger, producing 5-10kg blooms. When iron ore is heated in contact with carbon (the charcoal), the oxygen in the ore unites with the carbon to form an inflammable gas – carbon monoxide – which burns away, leaving a spongy mass of semi-molten iron behind. The temperature inside the hearth was crucial – high enough to melt the ore, but not too high as above a certain temperature the iron took up carbon and became cast iron which at that time was brittle and useless. The iron gathered within the base of the tower, above the tuyeres through which the air was pumped. Once the process was judged to be complete, the iron was taken out using long-handled tongs, and hammered on an anvil to expel surplus slag and to consolidate and weld together the iron into a bloom. It was then transferred to the smelting hearth where it was reheated and hammered into the required shape. This was wrought iron, which can be shaped by hammering, squeezing or rolling, but not melted and poured into a mould like cast iron. The earliest bloomeries – from the Iron Age to the Middle Ages – had bellows worked by foot (or hand), even though many were sited by water which was used for other purposes such as washing the ore or puddling the clay for lining the hearth. Bloomeries were widespread, temporary and seasonal in operation. Evidence for their existence usually consists of what came out of the furnace in the shape of mounds of slag or burnt charcoal, rather than remains of the furnace itself, but a few have been the subject of archaeological investigations. Cumbria has one of the largest concentrations in Britain, with 247 currently recognised within the National Park boundaries alone. From around AD1300, larger furnaces were constructed, sometimes referred to as stringhearths, this time using waterwheels to work the bellows, and increasing capacity to between 12 and 15 tonnes per year. (Click here to see a list of them). Later still, from the early 1600s to the early 1700s, water power was also applied to the operation of the hammers at the forge, which are known as bloomforges or bloomsmithies. The 1657 bloomery at Muncaster Head, for example, was fed by a leat from the River Esk, and Force Forge had three waterwheels powering the bellows at the two hearths and the tilt hammer. Each development increased the quantity and quality of the iron produced – at the bloomforge only 10% of the iron was lost in the slag, and each could produce as much as ten bloomeries, up to 50 tons p.a., although the more usual annual output of a Lakeland bloomery forge is put at 20 tons. The bloomforge was a permanent building, although largely made of timber, with a slate roof rather than thatch only over the forge itself. Its smelting hearth was 1.5 to 2 feet deep, and lined with iron plates. The cavity was filled with charcoal, and the ore, broken into very small pieces, was then laid in the top of the hearth. Passing through the containing wall was a tuyere or blast-pipe from the water-powered bellows. The higher temperatures that could now be reached in the furnace resulted in the non-iron elements in the ore combining with some of the iron oxide as a liquid slag which collected at the bottom of the furnace, and could be run off at intervals. The mass of iron was lifted out with tongs and taken to the forge. There it was reheated and refined before being forged into bar form under water-driven trip or tilt hammers. The Furness Fells have long been recognised as a centre for the iron industry in 17th century Cumbria – with sites at Cunsey (1618), Force, Hacket (1620s), Low Wood, Coniston, Spark Forge, Burblethwaite (near Bowland Bridge), Cartmel Forge (Cark Shaws), Backbarrow, and Stoney Hazel – but just as many important smelting sites have been recorded in other parts of Cumbria. Mike Davis-Shiel lists 30 sites, not including those such as Cunsey which were converted to use as finery/chafery forges in the blast furnace era. (Click here to see a list of them). However, even with this widespread activity, it is estimated that – for the year 1660 as an example – the total output of bar iron in this region was around 250 tons, roughly one hundredth of the national output. Even so, increasing production earlier in this phase of the industry had in turn led to a shortage of charcoal. For example, from 1564 to 1616, tenants on the Duchy of Lancaster’s land in the Furness Fells were prohibited from manufacturing iron, except for domestic use, in order to preserve the woodlands there. It is no surprise then that the building of bloomforges followed the introduction of a more sustainable approach to woodland management. Some of the output went to local smiths and ironmongers, some shipped further away. Bar iron from Coniston Forge, for example was sold in Keswick, Egremont, Bootle, Ulverston, Ambleside and Kendal. 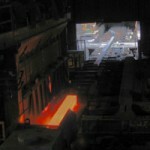 Much of the output from Milnthorpe Forge was sold in South Westmorland and North Lancashire, but some was shipped along the coast, to Preston for example. The Monuments Protection Programme has selected 37 sites in Cumbria relating to “early iron” (click here to see the list). The demand for increased production led to the abandonment of the direct process for the production of wrought iron in the bloomeries in favour of a two-stage (in-direct) process, where cast iron produced in a blast furnace had its carbon content reduced in the conversion forge. The end result was still wrought iron, the processes still powered by water and using charcoal as a fuel (at least initially), but on a much larger scale – 2 tons cast twice a day, giving 28 tonnes a week or 1450 per annum. Heated to higher temperatures to melt the ore, the process could continue for weeks or months, often until the charcoal stores ran out, unlike the intermittent process of the bloomery. 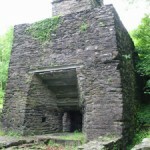 The early blast furnace was a masonry structure, 20’ high and 20’ square at ground level, within which a small hearth would be constructed. In Backbarrow’s case this measured 2ft square by 2ft deep. The charge of charcoal and ore were loaded into the stack above, with limestone as a flux to attract impurities – each in a certain proportion and a certain order – the fuel lit and the bellows used to raise the temperature enough to melt the ore. Molten iron and slag collected in the crucible at the base of the stack, and the iron was run off at intervals. This was cast iron – an alloy of iron with carbon (3 or 4%) and other elements – sulphur, silicon and manganese. To produce wrought iron, the iron ingots, or pigs, needed further refining in the finery and chafery forges (see below). A typical charge for a small blast furnace would be 200kg of iron ore, 100kg of charcoal and 20kg of limestone, which would produce 100kg of cast iron. Most of this went to be converted in the forge – either locally or outside the region, especially South Wales and the Midlands – although the range of cast iron goods made directly from the furnace gradually increased. Fell states that the number of men engaged in the actual working of a furnace was seven, of which 2 were founders or keepers, 3 fillers and 2 bridge-servers. The last named filled the baskets, while the fillers had to weigh and adjust the charges, and carry them up the steps to the top of the furnace. Other men were employed in roasting ore and ironstone to remove the dross, also in picking iron and charcoal out of the cinder, and in doing this work they were often assisted by their wives and children. 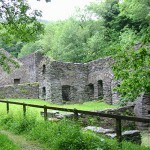 Click here to see more photos of Duddon Furnace. Early problems in converting pig iron made using coke in the furnace were overcome by the mid 1700s, and from then on coke rapidly replaced charcoal as the fuel of choice. (Click here to read more about coke production in Cumbria). By 1788, out of a total of 86 blast furnaces in Britain, 60 were coke fired, while the remaining 26 still used charcoal. At the turn of the century ironmaking was concentrated in the Weald, the Forest of Dean, South Wales, the West Midlands, North Wales, North Staffordshire/Cheshire, Derbyshire/Yorkshire, and Furness. By 1823 a total of 237 blast furnaces were in operation. “At the works, large assortments of the following articles are always kept upon hand, or manufactured upon the shortest notice: machinery used in the various manufactures of woolen, cotton, flax and tow and also for steam engines; boiler’s and bleacher’s pans and curbs; brewer’s mash vats and tuns; Bazellia stoves for halls, ‘compting houses etc. ; screw pins (malleable or cast iron) cut out of the solid, with brass or iron boxes suitable for paper mills, shipwrights, tobacconists, etc. ; Register, Pantheon, Forest, Bath and Laundry stoves, neatly fitted; gin sheaves, wagon wheels, and rails plates for collieries; every other article in the cast iron trade; charcoal bar iron; anchor works and sock plates; pit coal bar iron; malleable steam engine boiler plates; best English nail rods; Archangel nail rods for horse nails; iron hoops from Krotchkin’s Archangel iron; double and single rolled iron; clough plate”. Blast furnaces grew in size, and improvements were made to their design and operation, such as the introduction of hot air blast instead of cold; round rather than square hearths; a larger number of airholes (tuyeres); the use of slag (cinders) in the charge; the closure of the furnace top to re-use waste gases; and of course the application of steam power to the operation (although water powered bellows continued at Backbarrow until 1921). 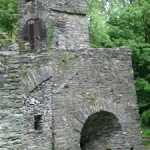 For example, the original masonry furnaces at Cleator Moor were replaced by steel-cased, closed top furnaces in 1862. The result was a phenomenal increase in production; pig iron output in Cumberland alone rose from just 25,000+ tons in 1856 to over 1 million tons in 1882. (Click here to see the figures). Pig iron was not just one standard product, Backbarrow, for example, produced a range of pig irons across ten approximate qualities, and customers would still order these by name until the 1950s. The first stage in the production of wrought iron was at the finery hearth. This was equipped with two airblasts – one to heat the fire and another to play across the iron as it was heated, so that the oxygen in the air would combine with the carbon from the molten iron and drive it off. The iron was refined and hammered into blooms or anconies, which were then passed on to the chafery – a word of French origin derived from chaufferie – to be re-heated and finally beaten into plates or bars. In the early years, although some was sold locally, the bulk of the bar iron was shipped out of the area, for example to the Midlands or Bristol, or to Liverpool, where it was used chiefly for anchors and chains, and in connection with shipbuilding generally. In 1767, bars from Backbarrow were hammered into plates at Cark Forge, worked at that time by James Stockdale and Company, who, a little later, were making “engine boiler plates” for the Wilkinsons. Towards the end of the century a mill for rolling iron into bars was erected at Newland, but the hammered bar was preferred, and the rolling appears to have been discontinued. The forges were either located with the furnace or occupied sites where iron-making had previously taken place. Charcoal supplies could be accumulated there, and previously acquired water rights, leats and watercourses could be put to good use. One furnace could support 4 or 5 forges on average. Cunsey Furnace for example had forges further upstream at Cunsey Forge, and at Coniston and Hacket. Wrought iron was king in the period up to the 1870s. In order to match the increased output of cast iron from the blast furnace, wrought iron was now produced in the puddling furnace rather than the finery forge. This consisted of two chambers – one containing a coal fire, the other the cast iron – with the coal out of contact with the iron. Flames from the fire were deflected or reverberated across to remelt the iron, and an airblast would remove its carbon content. The West Cumberland works at Workington, for example, used 32 puddling furnaces to serve the production of wrought iron plate. 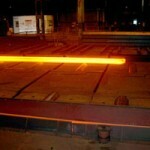 Steel has a carbon content which lies between wrought iron (0.1%) and cast iron (3-5%). It is not one metal but many, of 3 basic types – mild steel (with 0.25% carbon content), carbon steel (0.25 – 1.4%), and alloy steels. Carbon steel had been made from the early 1700s in the cementation furnace, by increasing the carbon content of wrought iron. In the cementation furnace, wrought iron bars were packed into fireclay chests or pots with a filling of charcoal. These were placed within a conical brick or stone structure and heated from below by coal. Since the chests were sealed the impurities from the coal did not affect the quality of the steel. The crucible furnace was a later development (1740) which re-heated the products of the cementation furnace to create a more uniform product. This made it a long and expensive process, so only small quantities were produced and its use restricted to weapons, edge cutting tools, small clock and watch parts, for example. The only reference to steel produced by this method in Cumbria is to an iron works at Cleator, a drawing of which shows a row of six conical furnaces in use in 1794. The suggestion is that the original iron furnace site (see above) was adapted to steel converting by a Yorkshire (Sheffield?) firm, but abandoned and demolished in 1799. Mild steel was a new material made by a new process – the Bessemer converter of 1856 – which used a powerful blast of air to create a chemical reaction which raised the temperature and burnt away the carbon and other impurities in the pig iron. A small amount of carbon would be added at the end of the process to achieve the desired composition. West Cumberland and Furness ore – being virtually phosphorus free – were ideally suited to the new process. Steel was suitable for almost every purpose for which wrought iron was used. It was very much quicker and cheaper to produce, and could be made in larger quantities than wrought iron could in the puddling furnace so that the manufacture of larger plates and joists was now possible. Of the ironworks sites listed above, some such as Ulverston concentrated on producing pig iron for use in local foundries or for shipment out of the area. Backbarrow, for example, supplied 200-300 forges in Europe and the USA, some tiny, some large firms such as Fiat and Singer Sewing Machines. Bessemer steelworks were added elsewhere, as at Workington Moss Bay and Barrow-in-Furness. Moss Bay – which had initially supplied steel plants at home and abroad with what was known as Bessemer iron – built its own Bessemer steel making plant and rolling mill in 1877, with three 8-ton converters, later upgraded to 15 tons and then replaced by two 25-ton converters in 1934. Bessemer steel output in Cumberland alone rose from 127,000+ tons in 1879 to 580,000+ tons by the turn of the century. (Click here to see the figures). As the iron and steel works in Cumbria closed in the 20th century, only Moss Bay remained – producing steel for rails until 1974, after which steel ingots were brought in from Teeside for reheating and rolling at the works (see photos above). 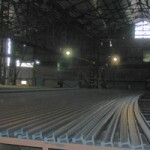 The Bessemer converter was complemented by the open hearth furnace – in use from 1866 to the 1960s – where the charge (which could include scrap iron) is laid in a shallow dish of vitrified silica sand and heated in a reverberatory furnace. Both had advantages – either could adapt to a variety of pig irons, and were capable of large scale production. The open hearth furnace became the principal means of tonnage steel making elsewhere in the country, but was a relatively minor activity in this area. The West Cumberland works at Workington built two open hearth furnaces in 1880 for the purpose of re-melting scrap from the rolling mills. 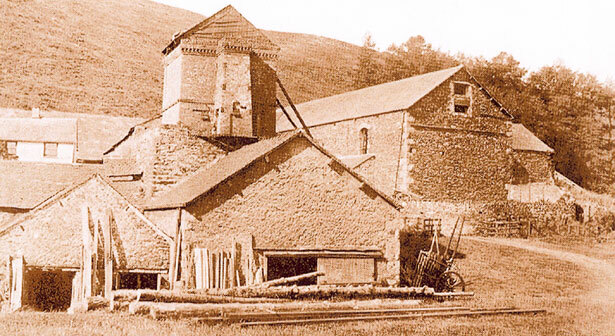 Moss Bay installed a small furnace in 1904, and eventually had nine larger ones until 1922. The open hearth furnace was itself overtaken by new processes for steel-making. Electric arc furnaces were introduced during World War 2 – first at Moss Bay, then at Distington (Chapel Bank). Here, four furnaces each of 20 tons capacity were producing alloy steels in what was the largest plant in Britain at the time. Millom was the site of experimental work in the 3 or 4 years before the plant closed in 1968. This was the trial of a new process for producing steel by treating iron with jets of oxygen as it ran from the blast furnace, known locally as “Millspray”. The Monuments Protection Programme has selected six sites of “later iron industry” in Cumbria (click here to see the list).